There's a wonderful story told by Keith Johnson, the outstanding author of “Impro” and “Impro for Storytellers”. When he was 6 years old he lived on a farm. He and his grandfather used to walk around the farm together making up a language about everything they saw. Eventually they could talk in this language together. Both of them loved it. When his grandfather died years later he discovered that he had learned Greek. Imaging the learning state of a boy being told 'we're going to learn Greek now' as opposed to 'let's play, how about calling that a....". Which state is more open, alert, joyful and effective? Plato said “I learn more about a man through an hour of play than through a lifetime of conversations”. We have harnessed this form of accelerated learning and made it a specialism. There is simply no way to understand the compelling and irreversible power of learning through play without experiencing it. It’s our primal programming as human beings and is innate to all human beings regardless of how ‘serious’, ‘logical’ or ‘traditional’ they are. Play has a different set of rules from normal life - people automatically expand their possibilities. When we play we expand our possibilities for creativity, communication, collaboration and leadership - all the places that count for organisations. We break habitual rules and establish new ‘possibility-driven’ attitudes and behaviours. The purpose of play is to change the rules. The moment that happens, all limitations of hierarchy are dropped, people lose their resistance to ‘getting it right’. They become present and discover themselves and others in new ways. 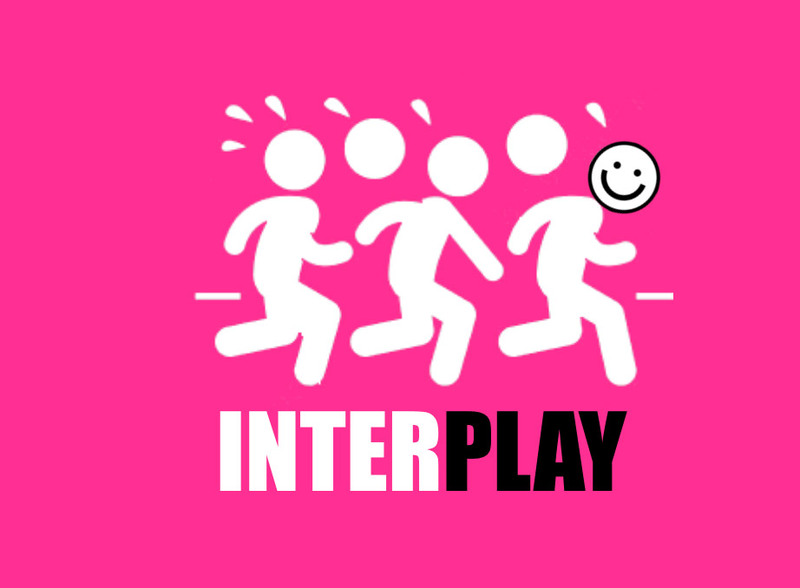 A repeated phrase in the feedback for InterPlay sessions is "I've never seen my colleagues like that before, so free and open", "I didn't even know this person was creative, "I had no idea this person was so much fun". How could people not be more effective in this state? And… they cannot go back to the way they were previously. It's permanent change. And it happens instantly. We can either deliver sessions on specific subjects - such as Creativity, Communication, Awareness, Leadership, Group dynamics, Trust - or design games that match your requirements. Quote from an executive director of leading European EU organisation after an INTERPLAY session. With Interplay sessions, we can help you generate mindset and behavioural change. Contact us to discover how we can respond to your requirements. A 10 MINUTE GAME CAN GIVE A LEVEL OF UNDERSTANDING THAT CAN TAKE DAYS THROUGH CLASSICAL TRAINING. Is there a mindset, a behaviour, a training or a message you would like to pass on to your people? We can translate it into live and/or online games and make it viral. We were playing some trust games with a team; helping them explore and push the boundaries of limitation. We asked the group some questions “What's your default here? Are you trying to get through the exercise unscathed where nobody gets hurt and there’s no risk of embarrassment or are you trying to explore the further reaches of possibility? What’s your default, managing risk or mining potential?". They said that their default was risk aversion. We then had a discussion about it “If risk aversion is happening in the game where there is very little real risk, where else is it happening? Who is affected by that? How does this impact on one’s ability to change and adapt? Do we really need this default and… which is more fun ‘risk aversion’ or ‘exploration of potential?’ “ We had dinner together that night. They said that they got more out of playing games for 1hour together than from any other training sessions or conferences they had ever attended before. Why? Because a playful atmosphere allowed for a core limitation and understanding to be revealed for which the effects were far reaching. The mindset of effectiveness also became so clear that it’s adoption became a ‘no brainer’. When one’s choices are so clear there really is no choice. How and when do leaders in an organisation tend to connect with each other? Often the most informal setting is over lunch or dinner. Most of the time though they are surrounded by colleagues and peers or sitting around a table having fairly formal, rigid and (let’s admit it) dysfunctional meetings. Relationships can become formalised and corporate. Throw a bit of politicking into the mix and suddenly a whole host of colourful dynamics ensue. What happens if you take those leaders into a room and play games - having them give instructions to complete simple tasks but with limited words and actions to uncover new levels of empathy or having them mirror each other while they tell stories to promote holistic listening? Is there any other form of learning that can achieve these results so quickly and sustainably as play? The games help new ideas and techniques enter into people’s vocabulary of being. They diminish and eliminate hierarchies and internal politics. In virtually every organisation with whom we have been involved for 25 years this has proved to be a fundamental shift. How does an expansion in leaders affect work relationships, people’s capacity to solve problems, their ability to pull together under pressure, manage crises and make decisions? InterPlay is seriously effective. HOW DO TASTER SESSIONS WORK? One could talk for hours and hours about a different possibility, share lots of stories, show people through examples and case studies how great teams work and it still may not change people’s behaviour on Monday morning. However, in playing themed games for an hour, the learning becomes totally immersive. They see it happening dynamically, they feel it, they hear it and… they get it. Participants inevitably want to bring the games back into the workplace. In response to this we have created a Games-Master train-the-trainer programme. Learning how to facilitate the games is key. Why? Because untrained people often want to recreate what happened during their game as opposed to creating new and diverse experiences for the group. The programme teaches them how to lead the games, how to spot key dynamics and how to effectively build on them. Once trained as Games-Masters, they can run sessions in any organisation or team, any time. It's great for away-days, team events, lunch breaks and everywhere in between. The games become stimulators for connection, creativity and communication and, after a while, they simply become a part of your culture.